Leena and Luna International, Japan was established as private limited company in April 2011 to contribute in research culture. It is also providing services for imports and exports to meet strong demand from many people living around the globe.It is a rich organization having global support of intellectuals, experts, scientists, researchers, and professors of social sciences, humanities, management sciences, natural and applied sciences. In 2012, on request of educational researchers and institutions , we have started an important task. We have launched three international research journals to support the researchers in social sciences, humanities, management sciences, natural and applied sciences. Since then, we have grown based on our mission of publishing quality research to promote research culture in developed, developing, and under developed countries around the world. On March 15, 2012, together with all our advisers, President of company has introduced a new corporate philosophy, “Contributing to international society through the research culture for better globe.” Committed to this shared philosophy, both the advisors and the management strive to achieve the corporate mission of pursuing physical and spiritual happiness for people around the world as well as contributing to the development of humankind and society. 9. To develop a think tank for solution of problems in different fields around the globe. 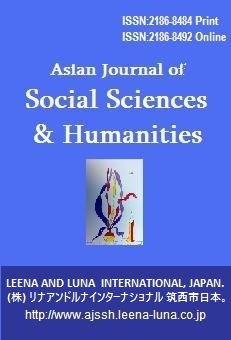 Asian Journal of Social Sciences & Humanities (AJSSH) is an international, professional, peer reviewed journal. It is regularly published quarterly (February, May, August, November) in English by Leena & Luna International (Pvt) Limited, Oyama, Japan. It is a scholarly journal of opinion and research in academic research. Its mission is to provide an interdisciplinary forum for discussion and debate about academicians researches most vital issues. It covers a wide range of topics of current concern in research in social sciences, and humanities. Each issue of will contain a variety of articles, essays, and book reviews.We are interested in receiving well-written and timely papers from individuals for possible publication. The focus of the publication is original completed research that has application to academicians, researchers, policy-makers, administrators,scholars,planners, scientists and teachers within the broad areas of academic research. Asian Journal of Social Sciences & Humanities would welcome manuscripts on Education,Economics, Geography, History, Law, Languages and linguistics Literature, Performing arts, Philosophy, Religion, Visual arts, Political science Public Administration, Publishing and editing, Psychology, Law, Gender studies, Cultural studies and ethnic studies, Social Work, Sociology, Anthropology, Archaeology, Area studies, Business, Divinity, Library Museum Studies, Journalism, Mass media and Communication,and other studies. Thesis writing services for ESL students. Write your research papers easily with professional term paper writers.